The project will start by looking at the vaccinia type I topoisomerase enzyme. 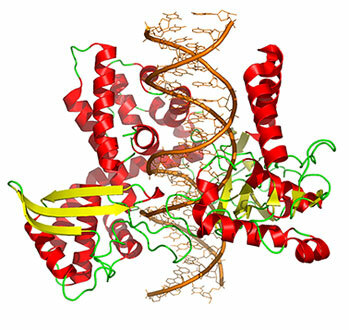 This enzyme is involved in the breaking and rejoining of DNA strands and the relaxation of supercoiled DNA. This is the important initial step before the vaccinia virus can start replication. This figure shows the action of vaccinia type I topoisomerase enzyme i) binding to DNA ii) formation of DNA-(3'-phoshotyrosyl)-enzyme intermediate iii) breaking of DNA strands allowing relaxation of supercoiled DNA, then genome replication and RNA transcription. The complete x-ray structure of the vaccinia type I topoisomerase enzyme is not known (its 314 amino acid sequence is known). 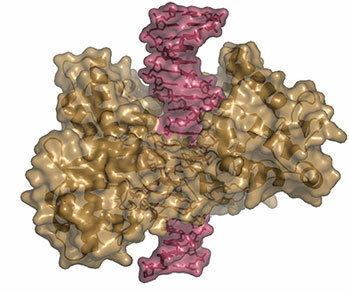 The structure two vaccinia type I topoisomerase fragments have been recently identified. An amino-terminal fragment of 77 amino acids was reported by Mondragon (1994) and Shuman (1998) identified the x-ray structure of the important reactive C-terminal catalytic domain (amino acids 81-314). Shuman postulated shape of the DNA binding structure with the two vaccinia type I topoisomerase parts. The units bind specifically at a DNA sequence of CCCTT. The figures below show different representations of the close binding to DNA by the two topoisomerase enzyme. The 3-D coordinate files for the vaccinia enzyme were obtained from the Protein Data Bank (structure references 1A41 and 1VCC). A DNA strand was generated containing the CCCTT sequence.